Rainy season, rainy season good old rainy season! Slowly, gradually the skies clear,the mercury rises and we enjoy slivers of sunshine. This is the time of year when we might even see rainbows. This is also the time of year when we are more likely to be caught out by surprise rainstorms as we think the sky is clear. Tuesday morning saw an unusually hard downpour before I was due to leave home in the morning. I left a little early to allow extra time. As soon as I walked through the gate I was confronted with a highly confusing picture. Right in front of me, where the road should have been, I could see children splashing as if they were in a swimming pool or river. 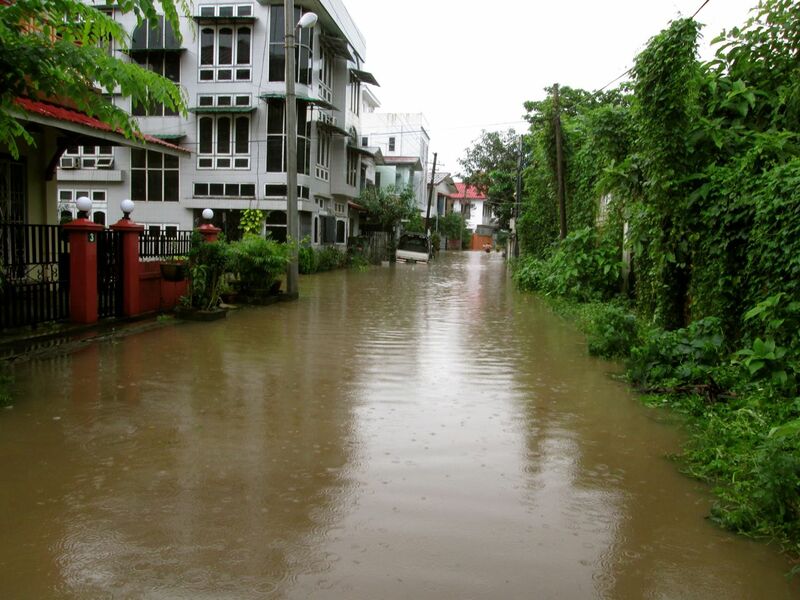 Where our street gently slopes downwards, our little lane had indeed become a river! Further down I could see men waist deep in water. 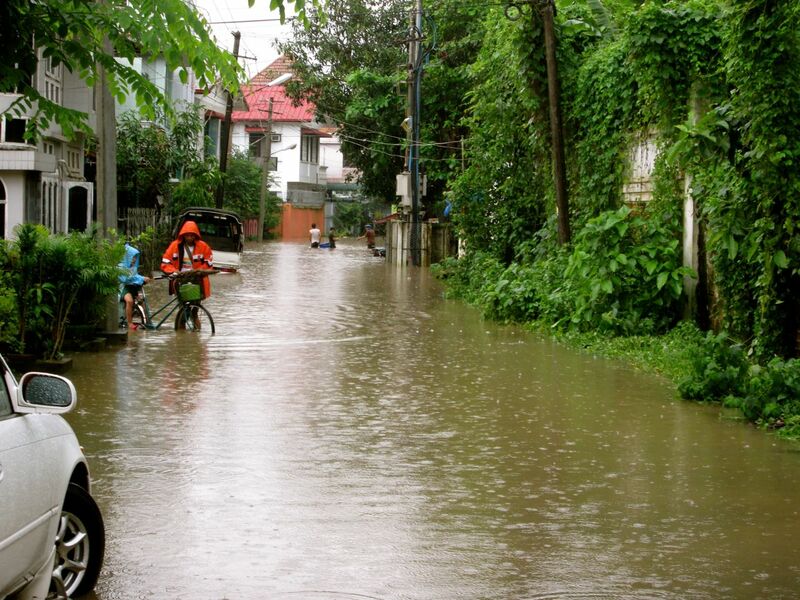 Apart from an inch or two of water, I have never seen our street flood, unlike many other parts of the city. Now it was completely inundated. 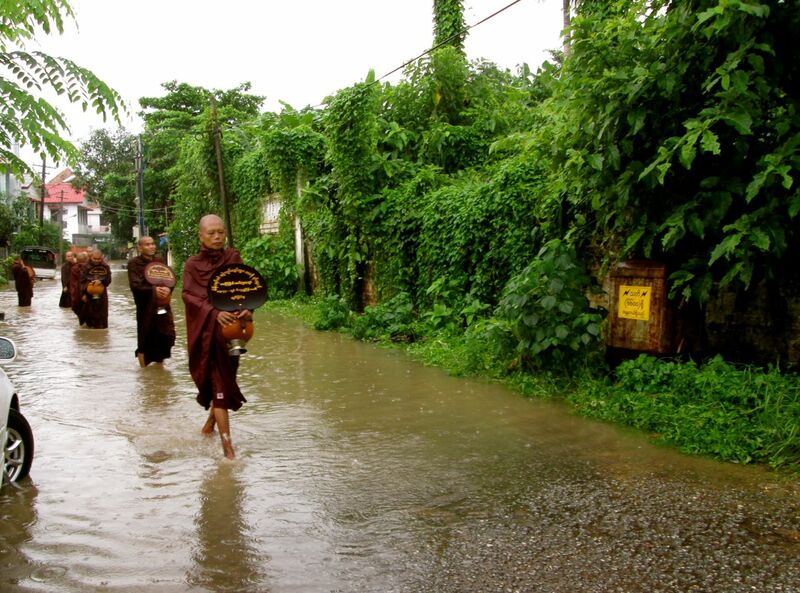 Incredibly, most folks were going about their daily business and wading through the murky water. 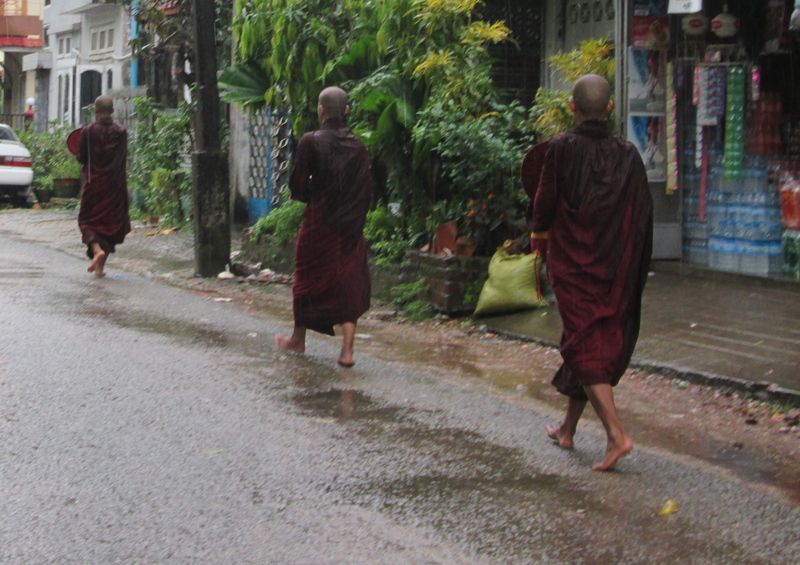 Children being carried or clinging on to the back of a bicycle as they get a lift, quite literally, to school, and the monks continuing to gather alms. All seemingly oblivious, at the most, slightly inconvenienced. While I stood like a complete wimp at the water’s edge phoning my office and taking photos before I returned home to wait. 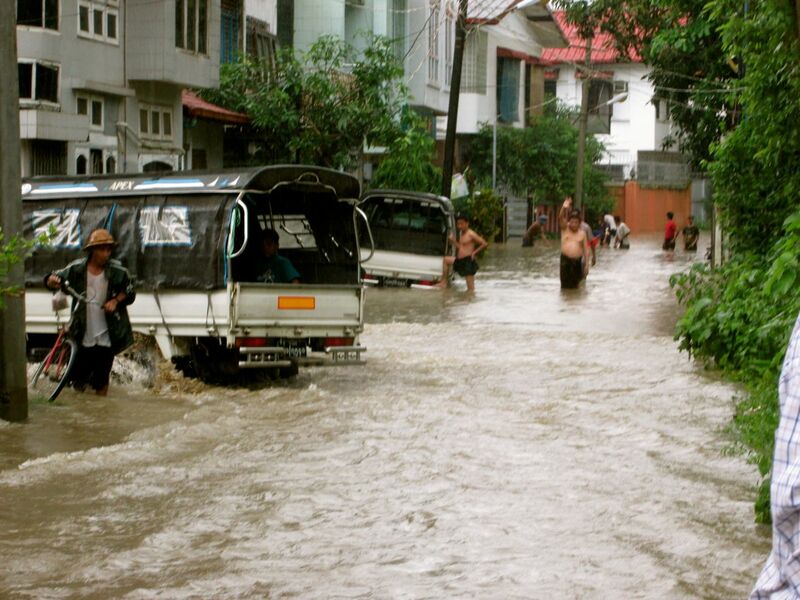 I was surprised that the waters receded fairly quickly, leaving major traffic jams and water-logged little cars stranded haphazardly around town. Soon there was little sign that the community had been inundated. And amidst this, I feel emotionally inundated though perhaps it is not visible. Work intensities take up enormous reserves of energy and time; I continue to strive to take time to smell the orchids, and have weekends and evenings filled with reading, writing and photography pursuits; working with a small group of women to organise awareness activities appropriately; swimming and cycling between downpours…….. In addition to that though, my mind is trying to assort and address some extras. It is nearly 6 months since my father’s death and that is in my mind constantly, unexpected prompts catching me by surprise, yet feeling that it is too long ago for many to realise that the pain is so raw. Healthwise, I am hurtling along “anniversary season”, having just marked the four year point from finding the lump, and being only 48 hours away from my four year cancerversary – the day that everything shifted and changed. The day I heard those words “this is highly suspicious of cancer”. And just to add to the overflowing maelstrom in my head, I will travel to Bangkok for my Big Checks in just over a week. There is not a great deal I can do, other than keep on swimming as the waters swirl around me, aware that Capt Paranoia is swimming towards me. I crave calmer waters and sunny skies. 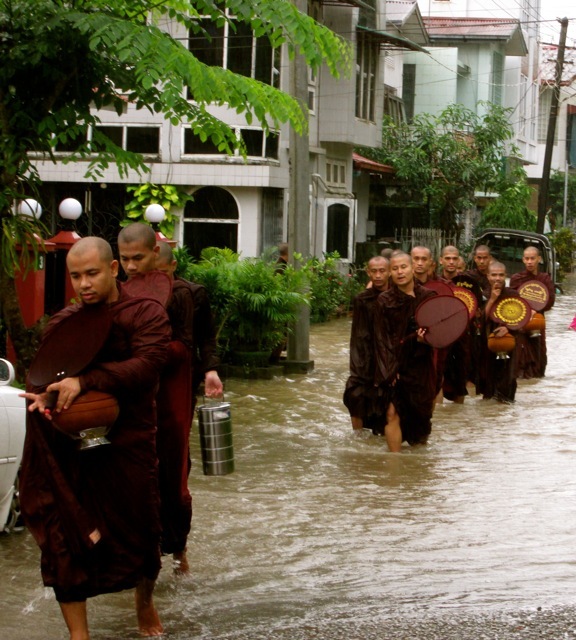 For the moment though I must hold on to the thought that this inundation will also pass, in its own way. I woke before the alarm this morning. Pre-dawn hints of daylight promised a clearer start to the day, a pause in the continuous monsoon downpours. As I dressed, streaks of pink formed and disappeared. An ordinary late September day. As the morning wore on, gathering clouds brought the pause to an end as more rains hammered down, the grey sky giving its clear message that rainy season is not ready to retire quite yet. A typical late September day. 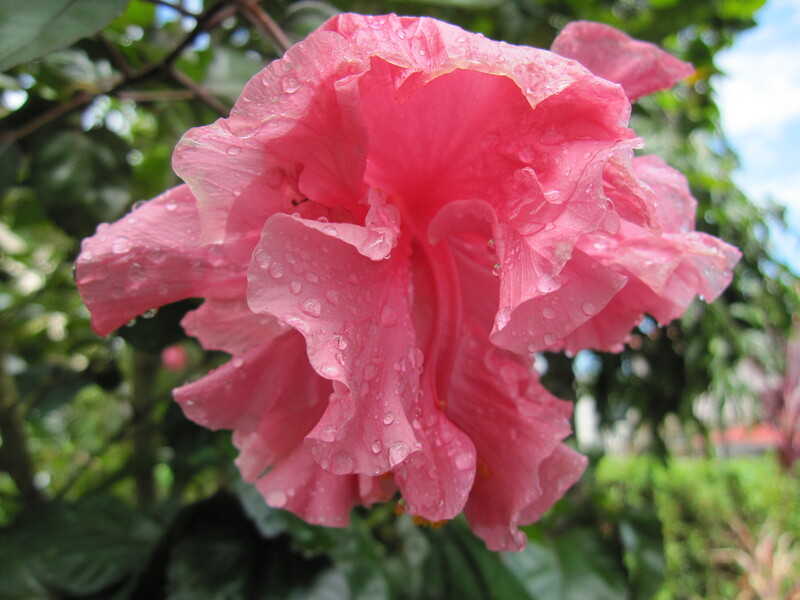 By this time in the rainy season, there is a musty heaviness in the air. A constant dampness. The relief of a refreshing shower before sleeping cleanses the clamminess we gather during these days. A unremarkable late September day. It was such an ordinary late September day four years ago today. So ordinary I can’t remember how the day started, or what time it might have rained. I have no recollection what I ate for supper that evening. What I do remember is the chill of fear in my gut during when showering before sleeping. I can remember exactly how it felt when I felt the lump that should not have been there. I clearly remember exactly where it was. And that it was still there when I prodded after a few moments, praying I might have imagined it, or it might have disappeared. At that very moment, that particular late September day became suddenly extraordinary. Memorable. For all the wrong reasons. Four years ago, in the evening of 23 September 2009 I discovered the lump which was to challenge everything I thought was sure. How sweet the air must have felt that unremarkable morning in late September four years ago as I went about my ordinary daily journey. Oblivious to what was ahead of me only a few hours away. We have no idea what is ahead of us, what unpleasantness might be on our horizon. We must not forget to pause and drink in the little details around us and the precious moment we sometimes miss. Tomorrow may look very different. 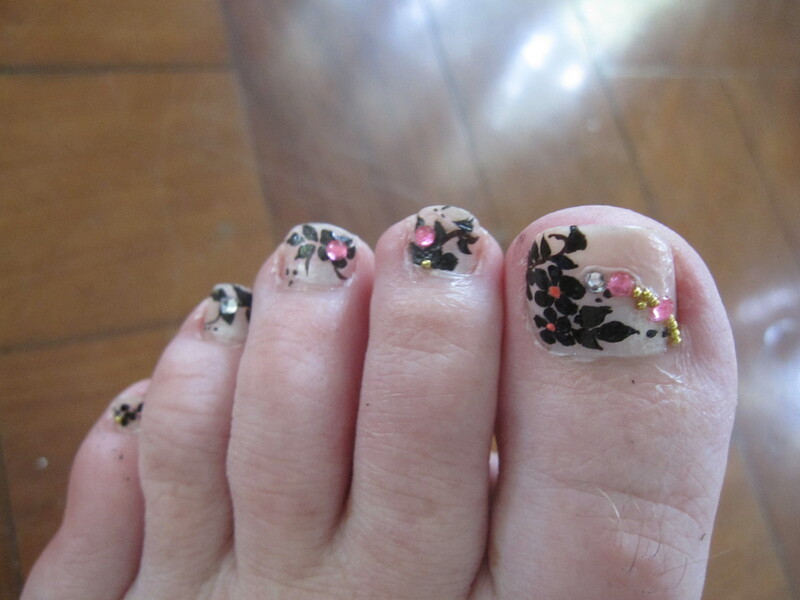 Life is too short NOT to have funky toenails! I visited Paris for a long weekend a long time ago, probably approaching twenty odd years or so ago. Clutching my copy of “Pauper’s Paris” I craned my neck over the crowds to see the Mona Lisa, gasped at the traffic on the Champs Elysées from the top of the Arc de Triomphe, tip-toed around the echoey Nôtre Dame Cathedral, bought a twee little cut-out of my silhouette fashioned in seconds by a Sacré Coeur artist and sipped café noir from the terasse of the Café de Deux Magots. Classic Paris experiences. 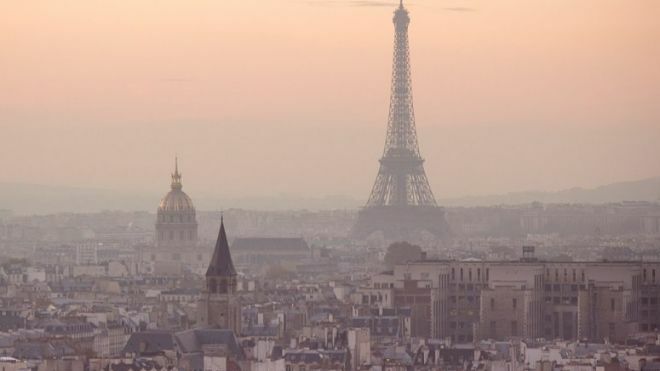 But of course, no visit to Paris is valid unless you see the Eiffel Tower and I was eagerly looking forward to the spectacular view of the city from its heights. I knew that the stairs would be a climb, but the lift seemed too speedy and exposed and I naturally opted for the low tech and cheaper option. By the time I reached two or three twists in the iron stairway it was clear something was not right. My head was looking forward to the views, but other parts of my body were not cooperating. I was shaking, my heart was pounding and my legs were unable to hold me. Worst of all was a bizarre and severe dizziness. I looked upwards through the iron steps and an overwhelming wave of dizziness and nausea paralysed me. I was escorted down the steps slowly and gently to gradually regain my equilibrium on terra firma. 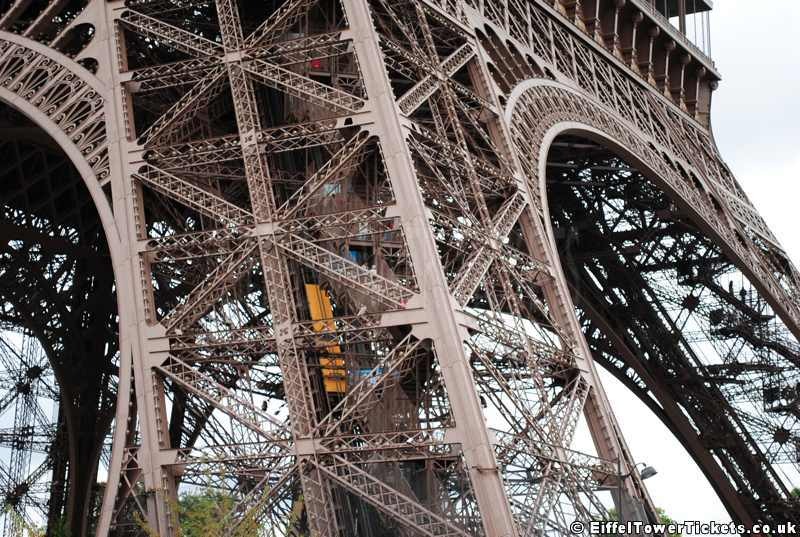 It took some time for the shaking to subside and even a look upwards towards the top of the Tower would bring an instant return of the dreadful dizziness. And that is how I learned I have a touch of vertigo! I know now what sets me off, and that aeroplanes are fine, steep mountainsides manageable if I look at the landward side and that if I am up high and I can see through to the ground below me (for example through the slats in an iron stairway or bridge) then I am in trouble. Being offered a job in Nepal in 2000 was enormously exciting, but there was one Big Elephant in the Room. 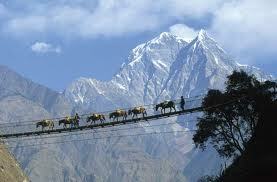 Nepal has hills, nay mountains and not just any old mountains. The Himalayas. I knew that my job would take me to remote parts of the country, often on foot. And that would invariably involve crossing narrow ravines, which would involve breath-taking, vertigo-inducing suspension bridges. In my five years plus in Nepal I crossed more suspension bridges than I could count, and every single one was a challenge. It was well known that I dreaded journeys which involved these bridges, but there was not an alternative if I wanted to do my work. I gradually developed a technique which got me over the bridges even if every single one prompted the same trepidation. I knew that it helped to have someone walk directly in front of me, taking up most of my immediate field of vision. I would focus on the back of that person and not let my eyes see either steepness and drop on either side, nor the ground underneath my feet. I needed to trick my eyes and get myself across the bridge without the involuntary prompt that I knew would launch into a full scale vertigo attack. So recent thoughts on seeking balance, and the image of a tightrope was in fact one very pertinent. A few days later, in the weekly #bcsm Twitter discussion, the topic of balance arose and I was immediately struck by one Tweet which quoted a saying that “life is a narrow bridge” and the trick is not to be afraid. “Life is a very narrow bridge. The important thing is not to be afraid” Rebbe Nachman of Bratslav. This instantly resonated, especially in the space which I am in at the moment. Life is indeed a narrow bridge, and is sometimes pretty precarious. At the moment I am balancing so many different things across the spectrum of personal, health, well being and professional. How can I find that spot on the narrow bridge where I feel that I am taking enough well-being time without the pressures of tasks intruding into the healing space? How do I deal with all of the things which are piling up for me to carry on my shoulders as I walk along my narrow bridge? How do I keep my eye on the road ahead and avoid slipping down the steep slopes around me? I am do not mind admitting that I am afraid or anxious. In two weeks time I will be drawn onto the game-show conveyor belt of the Big Checks moving from blood draws to mammo and on to X-ray. Next stop probably ultrasound. Then through the doors of Dr W2 and my score will be given to me. Will I qualify for a bonus round? CT Scan? Bone Scan? MRI? Or will I be allowed to step off the belt and slope away to tally the totals and take stock? Who knows. Of course I am afraid. It is difficult to take time to relax and build my resilience ahead of these checks while all around me is so incredibly busy. Seeking balance continues to be prominent in my mind. My head is full of such an assortment of competing callings. I am trying to carpe the diem and not to drown precious days in the mundane and the manic. Kirsty reminded me last week to “take time to sniff the orchids”. Indeed, so much is gained from a pause to breathe in simple goodness. Which takes me back to the narrow bridge I am on. I know that I can’t not be afraid. 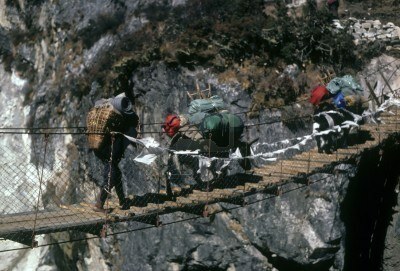 However, I also know that there are techniques and tricks, which I can muster to minimise fear and distract me, in the same way as I get myself across the suspension bridges in Nepal. The toenail trick is one such. Although my toenails eloped with Taxotere for a bit, they are back if a bit ridged and ugly. Prime material for a bit of bling! 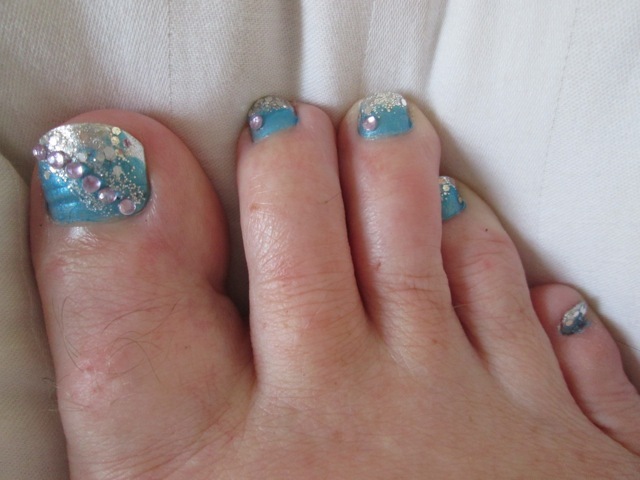 That was the first of many varied toenail art experiences, all of which I have loved perhaps with the exception of the one which should have featured starfish, but more resembled the stars and stripes! I have nothing against the US flag of course, but it would not necessarily be my first choice to sport on my toenails! Having funky toenails is a very easy indulgence to fulfil and one which brings a disproportionate amount of simple pleasure. The toenail trick guarantees distraction and has resulted in an unexpected amount of attention. Perhaps I am a bit too old for this kind of toenail trivia but I do not care. Toenail art is one of the best tricks in the book to bring things into perspective and bring stillness to calm the vertigo induced by the current dizzying busyness and pre-checks anxiety. After all, is life not far too short, not to have funky toenails? As promised, and introduced – here is ……………………………. Clare and Claire – and the Adventures of Claire Never-Ending. It’s hard to remember exactly when I started to read the Feisty Blue Gecko – with treatments, blogging, and stepping into social media, when did this world of #bcsm support erupt all around? At what point did it move beyond ‘curiosity’ and become ‘community’? 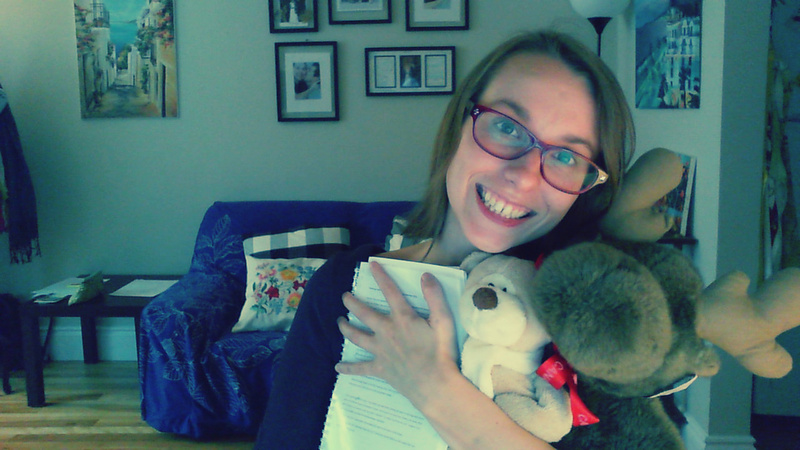 While I cannot remember exactly when I started reading this blog that Philippa shares, I can remember how I felt (and still feel) when encountering her story. Philippa was enchanting. Somewhere in a world so far away from mine, she was writing about the rainy season and explosions of flowers. She was writing about her bicycle, and her camera, and the tiny frogs that seemed to hop into her life along with the geckos. There were pictures from her travels . . . I remember one post where she rode a train around her town and took photographs of people sitting cross-legged on the benches, blurs of villages being passed, the vendors taking their goods to market. There is a story in the Feisty Blue Gecko that goes so far beyond breast cancer. For me that engagement with the wonderfully simple yet exotic pictures of her life was the starting point of our connection. Sure, we’ve both had breast cancer – but life is so much more than cancer. What an unexpected and yet totally perfect surprise. The cherry on the connection ice-cream Sundae. Adventures of Claire Never-Ending is really, deeply about connection. Through the telling of individual stories, you are taken on a journey across time featuring a line of women spanning eight generations, where all of the women share the middle name of Claire. The book starts in 2011 with Amelia Claire, then the next story features Elizabeth Claire (Amelia’s mother) as a young women in 1980, then the following story is about Dorothy Claire (Elizabeth’s mother) in 1957 . . . and so we go back nine generations. They share the middle name of Claire so that as each women marries and takes her husband’s name, she can pass forward a ripple of identity that connects them together across time. So who know, Philippa, maybe we’re soul sisters split across many generations? I do have some family that originates from Scotland! It’s being sold right now online at this Kickstarter project page. We’ve exceeded our goal of $3,000 – but I will never exceed my goal of getting it into the hands of every curious reader all over the world. If you would like a copy, please do consider ordering within the campaign. Suggest it to your book clubs. Maybe pick up a copy for your friend? To me, sharing our stories is a powerful way to build connection. Whether we’re connecting with women we’ve never met because they live across the world (hello! ), or because they lived 100 years before we were even born, the storytelling brings us together. It’s almost magical that way. And that also happens to be how I feel about the stories we share in the #bcsm community. From the weddings, gardening, family outings, and travels . . . the rants, frustrations, and ridiculousness . . . the heartbreaks and the losses . . . the triumphs and the breaking news . . . it’s the storytelling that holds us like a glue. 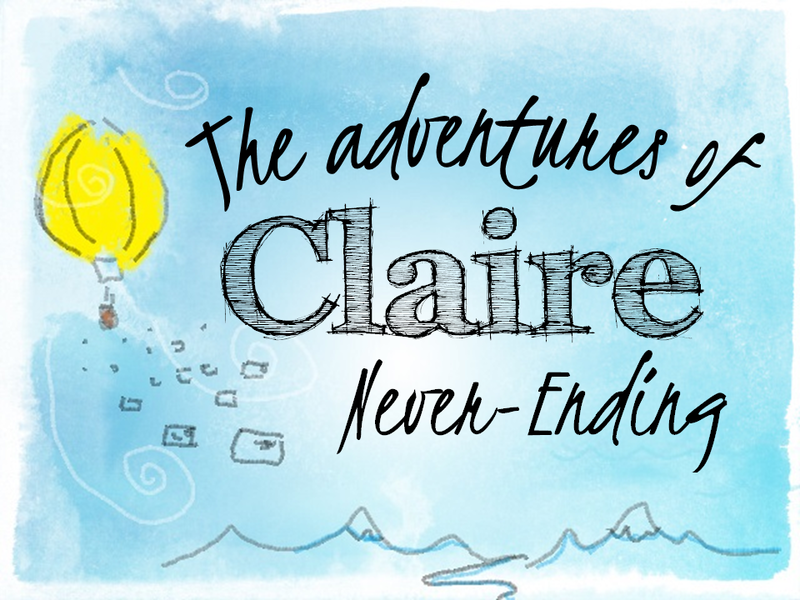 Thank you so much, Philippa, for letting me share about the Adventures of Claire Never-Ending. To imagine it reaching all corners of the earth is a dream come true. This Kickstarter campaign has been outstanding, and a lot of that support has come from within our #bcsm community. So I’m just full of thanks. And if you’d like your own copy of my book, please do pop over to the campaign and order one. If everything goes right, they’ll be shipped out come December. I often wonder, if this were ten years ago or so, just how different life living overseas and with breast cancer would be. It is very hard to imagine. A refrain of mine is the one around the depth of meaning in the friendships we develop online (or mainly online), particularly prompted by the breast cancer experience. 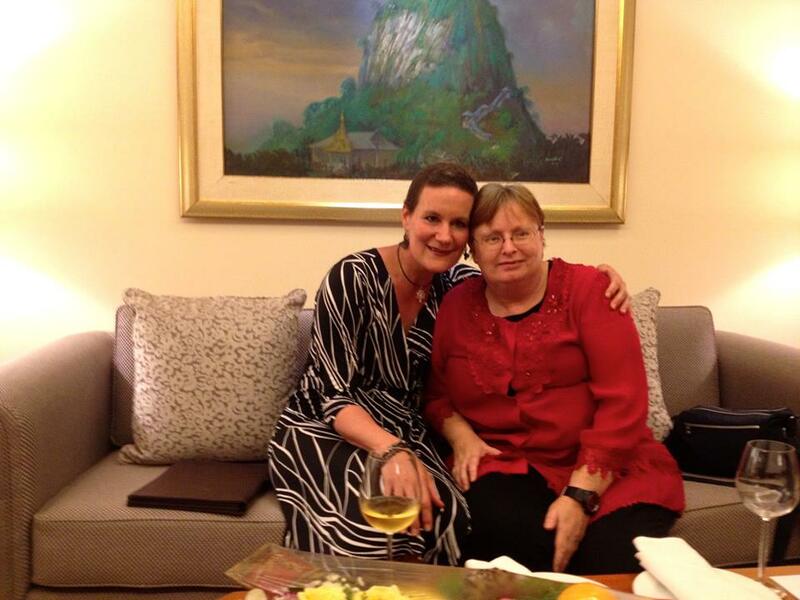 My connection with Kirsty Sword Gusmao (who wrote such an insightful guest post here recently on Timor-Leste) is a clear example of how such a connection can develop, especially given that we share so much more than our breast cancer experience, as I described earlier. We have both settled in countries very different to the ones where we were born, married to men from very different cultures to the ones of our own origins and we are passionate about equity and rights especially in the fields of women, children and the most disadvantaged and vulnerable people. Kirsty and I met fleetingly three years ago long before her cancer diagnosis which was to be the catalyst which put us in contact. We have been eager to connect properly, in “real life” as we know we have such a great deal to talk about. 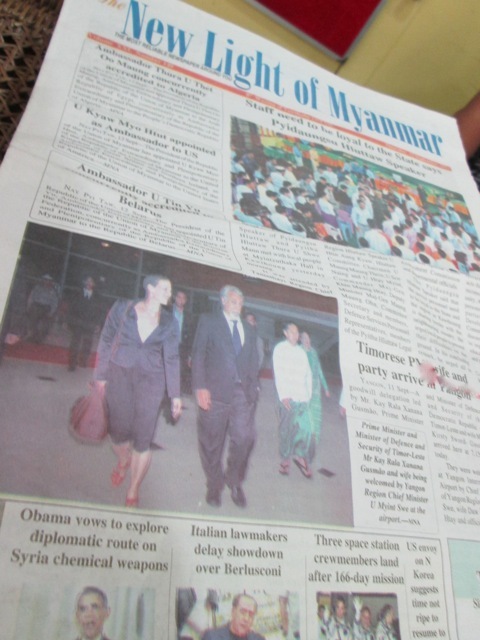 That opportunity presented itself this when it was confirmed that Kirsty’s husband, Xanana Gusmao, would be leading a delegation visiting South East Asian nations – including a short and packed visit to Myanmar! As soon as Kirsty arrived, we started sending messages and were able to speak on the phone. It is so funny to hear a real voice where there has only really been a voice in your head prior to that. We don’t realise how much we create a voice in our minds, that part which is largely missing in internet communication. It is so reminiscent of meeting someone for the first time when you have no idea how they look, particularly in those pre “Facebook and Google image search” days. Despite a very busy schedule around the country and little time here in Yangon, Kirsty generously found a space for us to meet up. And as anticipated, we managed to pack an array of conversations around an incredibly diversity of topics. I can’t thank Kirsty and her husband enough for sharing precious free time with me in such a full schedule. It was somewhat surreal to be in the company of people whose stories are so well known in the world. Moreso, though it was humbling, inspiring and an enormous privilege. What an incredible world we live in, that a combination of factors, including our doctor, the internet, breast cancer and a passion for equity enable such a meeting for like minds and hearts. We are now scheming how, when and where we can continue these conversations we have started. 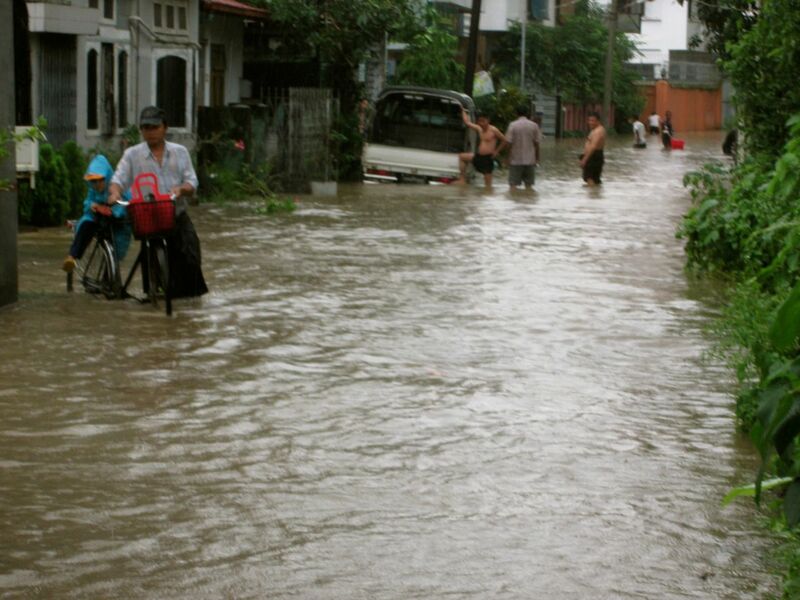 As we move into September, we look for signs that the rainy season is starting to subside. Longer pauses between downpours, larger fragments of blue sky and a slight fatigue of the mould spores and cloying humidity which cling to the monsoon days. 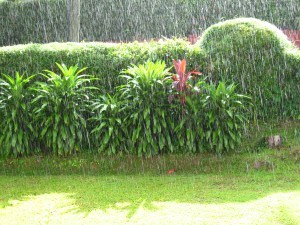 I think I will never tire of the stirring I feel when the rains pound down outside, clean and dry inside. Still, the thought of days uninterrupted by rains which can paralyse city life is appealing after these months of rain. There seems to be a fine balance between days which are too wet, and those which are unbearably hot. Finding a balance between wellbeing and the pressures of everything-that-needs-to-be-done is equally not easy. A much milder bug has visited me this week, causing worry in my heart that I would again be floored. Happily, it has turned out so far to be a manageable, if tiring, visitation. More interestingly, however, there have been a couple of unexpected developments this week. A major piece of work needs to be completed and I started the week with my mind buzzing, trying to catch and organise the priorities flying around. Lists were forming and reforming in my head, like a Harry Potter spell, changing places and merging before I could grasp any order. From somewhere came a compulsion. I closed my eyes and attempted to still my mind, focusing on my breathing, the sounds of the morning outside melting as I slipped into a short meditation. Something I have not practised for quite a while. Rising from the meditation, I moved into my usual morning routine. But when I sat down with my tea after breakfast, I had a pen and notebook in my hand. A growing compulsion was pushing me to pick up another practice which I had not done for some time. I started writing furiously, three “Morning Pages”. So even before heading to work, I had drawn in two different approaches to set the tone for the day. And you know what – the was indeed highly productive! This has continued throughout the week, a 15 minute meditation followed by the Morning Pages routine. and similarly focused and productive days. Now arriving at Saturday evening, the day has been less so, but I reckon that is important. It is part of that balance. Plans are being hatched at the moment and these will appear here in the coming weeks. There will be updates and discussions on plans we have for raising awareness about breast cancer here. Yes, awareness – it is part of the picture only, for sure. But it is critical. There are plans for visiting guest posts and their news here. 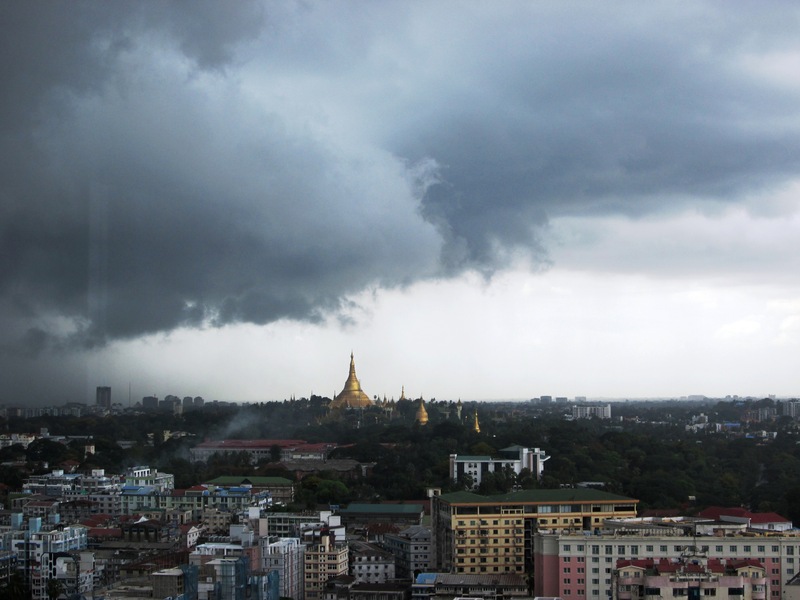 And I hope to share some very exciting news about a visitor coming to Myanmar next week……….. we are trying to juggle in a chance to meet up and I cannot begin to express how greatly I hope that this will happen. In some says it feels a bit like a tightrope walk at the moment, keeping my eyes firmly ahead, and attempting not to lose that sense of balance and land too heavily on one side or the other.